(Nanowerk News) Sound waves passing through the air, objects that break a body of water and cause ripples, or shockwaves from earthquakes all are considered "elastic" waves. These waves travel at the surface or through a material without causing any permanent changes to the substance's makeup. Now, engineering researchers at the University of Missouri have developed a material that has the ability to control these waves, creating possible medical, military and commercial applications with the potential to greatly benefit society (Nature Communications, "Negative refraction of elastic waves at the deep-subwavelength scale in a single-phase metamaterial"). "Methods of controlling and manipulating subwavelength acoustic and elastic waves have proven elusive and difficult; however, the potential applications--once the methods are refined--are tremendous," said Guoliang Huang, associate professor of mechanical and aerospace engineering in the College of Engineering at MU. "Our team has developed a material that, if used in the manufacture of new devices, could have the ability to sense sound and elastic waves. By manipulating these waves to our advantage, we would have the ability to create materials that could greatly benefit society--from imaging to military enhancements such as elastic cloaking--the possibilities truly are endless." In the past, scientists have used a combination of materials such as metal and rubber to effectively 'bend' and control waves. Huang and his team designed a material using a single component: steel. The engineered structural material possesses the ability to control the increase of acoustical or elastic waves. Improvements to broadband signals and super-imaging devices also are possibilities. 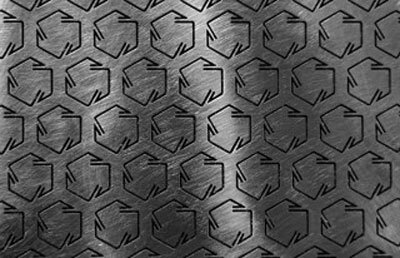 The material was made in a single steel sheet using lasers to engrave "chiral," or geometric microstructure patterns, which are asymmetrical to their mirror images (see photo). It's the first such material to be made out of a single medium. Huang and his team intend to introduce elements they can control that will prove its usefulness in many fields and applications. "In its current state, the metal is a passive material, meaning we need to introduce other elements that will help us control the elastic waves we send to it," Huang said. "We're going to make this material much more active by integrating smart materials like microchips that are controllable. This will give us the ability to effectively 'tune in' to any elastic sound or elastic wave frequency and generate the responses we'd like; this manipulation gives us the means to control how it reacts to what's surrounding it." Going forward, Huang said there are numerous possibilities for the material to control elastic waves including super-resolution sensors, acoustic and medical hearing devices, as well as a "superlens" that could significantly advance super-imaging, all thanks to the ability to more directly focus the elastic waves.